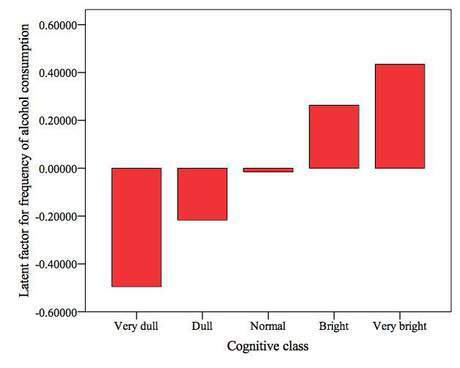 The following graph shows the association between childhood intelligence (grouped into five “cognitive classes”: “very dull” – IQ < 75; “dull” – 75 < IQ < 90; “normal” – 90 < IQ < 110; “bright” – 110 < IQ 125) and the latent factor for the frequency of alcohol consumption. The latter variable is constructed from a large number of indicators for the frequency of alcohol consumption throughout adult life and standardized to have a mean of 0 and a standard deviation of 1.0. The data come from the National Child Development Study (NCDS) in the United Kingdom. There is a clear monotonic association between childhood intelligence (measured before the age of 16) and the frequency of alcohol consumption in their 20s, 30s, and 40s. “Very bright” British children grow up to consume alcohol nearly one full standard deviation more frequently than their “very dull” classmates. I'm obviously an aberration. (I have a measured IQ of about 145 and barely drink.) Or maybe I just need to drink more…? DianneorDi, well, y'know, I'll be predictable and vote 'more'. Oh, this explains EVERYTHING! .grin. That has to be an English thing, all the americans I know who drink a lot happen to be quite stupid. transceptor, interesting. Maybe you need to meet some more people? Previous comment was: @tranceptor, not so fast, amigo :) I keep up just fine with my English counterpart, and I'm pretty smart! I really do think this is a cultural thing, I imagine that if the same study was done in the u.s. then the results would be considerably different. As someone in the “very bright” range, how often I drink is measured in months. Though I admit to feeling a lot smarter after a few drinks.